Click the button [Save] when “File Download-Security Warning” dialog box pops up on the screen. 1. 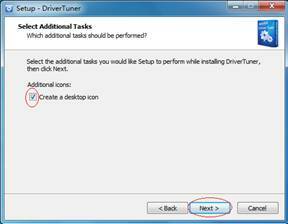 On the “Setup-DriverTuner” interface, click the button [Next] to continue. 2. 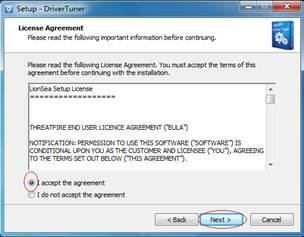 On the “License Agreement” interface, tick “I accept the agreement” and then click the button [Next] to continue. 3. On the “Select Destination Location” interface, click the button [Browse…] to choose the destination location, and then click the button [Next] to continue. 4. 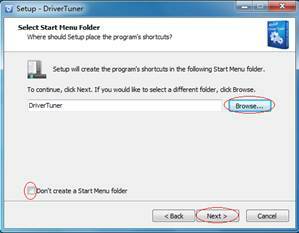 On the “Select Start Menu Folder” interface, click the button [Browse…] to choose the start menu folder, and then click the button [Next] to continue. 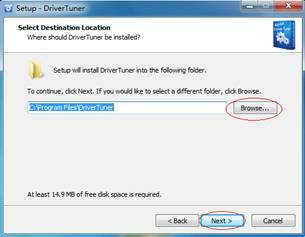 Note: If you do not want to create a start menu folder, you can tick “Don’t create a Start Menu folder”. 5. On the “Select Additional Tasks” interface, you can choose to tick “Create a desktop icon” to create an icon on the desktop, and then click the button [Next] to continue. 6. 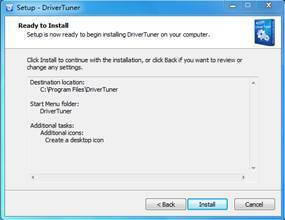 On the “Ready to Install” interface, click the button [Install] to continue. 7. 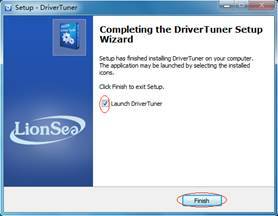 On the “Completing the DriverTuner Setup Wizard” interface, click the button [Finish] to exit the set-up and launch DriverTuner. Note: If you do not want launch DriverTuner, you can also choose to untick “Launch DriverTuner”.